Nice! Looks like a very sweet book. Yes, Jayne, it is sweet; it has lots of heart. Love that personality emphasized as important over appearance or ability. We’re looking to adopt a dog this fall. Might look for this to read to my daughter! Thanks for sharing! I think this is a book that has a nice message but doesn’t preach. I hope you let us know when you get a dog. Sounds like an adorable book. It is, Karen, and it has a sweet message. 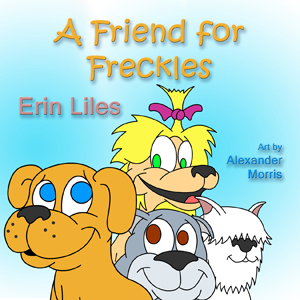 Freckles sounds like such a sweet story. Congrats on your new book, Erin. Thanks for sharing it, Barbara.